Buckingham Court House: Dr. Tucker House | slate river ramblings . . . . Viewing historic houses in Buckingham County is a favorite pastime of many readers of Slate River Ramblings. The Dr. Tucker House has a slate roof, of course. 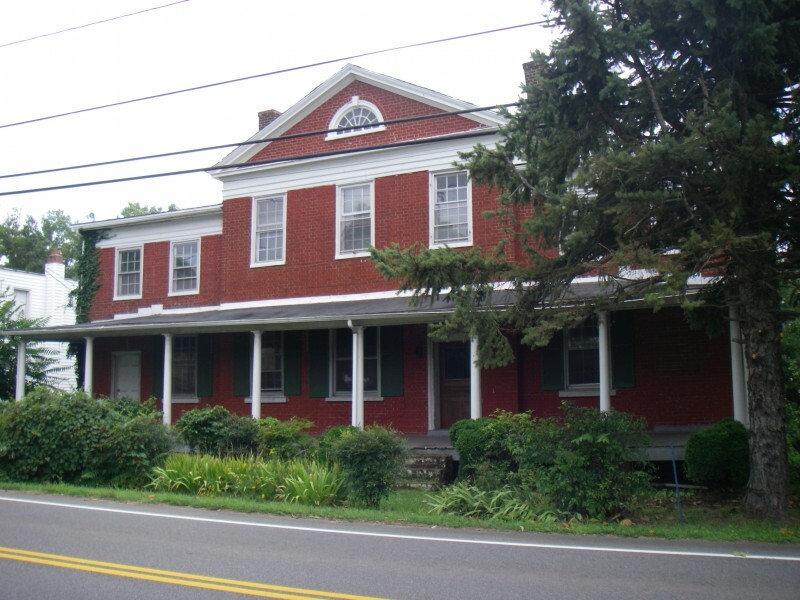 It is situated on over 2 acres in the historic village of Buckingham Courthouse in Buckingham County. The house is located catty-cornered from the old courthouse. The original courthouse designed by Thomas Jefferson burned in 1869. The existing courthouse was built in 1873. It is thought that the Dr. Tucker House served various purposes in the past, including the housing of a tobacco warehouse in the basement for a time. The house was also used by the Treasurer’s Office, possibly by the Masons for a lodge and may have served as a bank. Four doctors have past connections with the house: Dr. Whitcomb Pratt, Dr. Perkins Glover, Dr. G.L. Morris, and Dr. P.E. Tucker, all who practiced medicine on the premises. The Dr. Tucker House still possesses a rare, Jeffersonian accordion or peak and valley roof on the west wing, probably the only surviving example known. The brickwork under the front porch still retains it original penciling on the mortar joints from the Federal period. The Dr. Tucker House is a contributing structure in the Buckingham Court House District which is listed on the Virginia Landmarks Register and the National Register of Historic Places. Larry, As time goes by, Slate River Ramblings will post more about the doctors of Buckingham County.